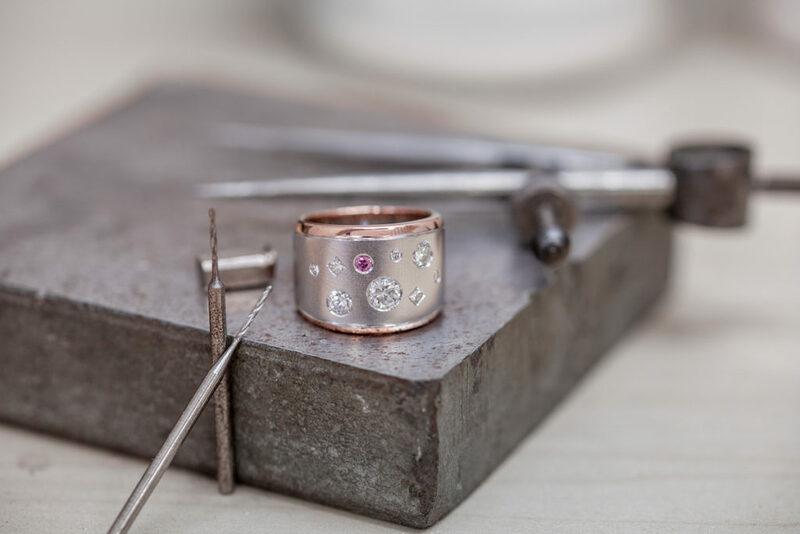 Creating timeless jewellery is an art form. We speak with Jewels of the Kimberley director, Jodi Penfold, about intricate techniques, pearl farming and why she loves diamonds. It’s a fond memory, even if that pendant is now one piece in the thousands Jodi has created as designer, creator and director of her Broome-based business, Jewels of the Kimberley. Jodi took a practical route into jewellery design. As a third-year apprentice, she started her own business, signing a “handshake contract” with an elderly travelling salesman of Cook Island black pearls and Australian sapphires. In those pre-YouTube days, she researched skills in books in order to create the designs, fuelling a desire to learn as much about the craft and its techniques as possible. This motivation saw her jumping on a flight to Broome to take her experience from the page to real life, grading pearls. “I have fond memories of just how raw pearl farming can be,” she says, going on to recount the incongruity of “wading waist-deep in a crocodile-infested creek” while holding three million dollars’ worth of pearls in her hands. Following her pearl adventures, Jodi went on to study gemmology, which she says has been instrumental in learning about care of gemstones and “being able to confidently push them to their limit in both design and manufacture”. Over the years, Jodi has developed a particularly fondness for Australian diamonds, although she admits to thinking that white diamonds were “a bit boring” before the Kimberley showed her the “rainbow of hues diamonds have to offer … from the rarest pinks to fiery oranges and rich, deep greens”. Her passion for the gemstone led her to an exclusive diamond-setting school in Antwerp, under the tuition of a fastidious, unsmiling Russian. That doesn’t mean she’s impervious to trends, though. She expresses a fascination for rustic or Earth diamonds, particularly popular with modern brides. “Each one so unique with different characteristics, some with translucency, others more opaque,” she explains. “Most feature a distinctive salt-and-pepper matrix … reminiscent of staring into a starry night sky.” She also points out that you can get them for a “fraction of the cost” of their refined counterparts. Jodi’s passion for honing her skills has now come full circle as she trains her own apprentice. It hasn’t always been easy to find a mentor, but 20 years into her career, she can honestly say that it was worth “sticking out the hard times” to be able to work so closely with the inimitable Australian jewels of the remote region she calls home.